These novels are complete in themselves and can be read separately, according to information from their author.
" 'Ghosts have very sharp ears. They can hear a child breathing a mile away.' 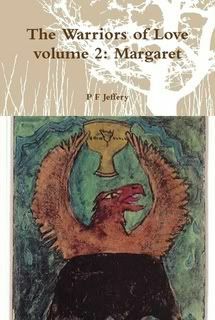 "
Predominantly, this chapter is a series of charmingly written dialogues between Margaret as a young girl and her Nanny, the former full of childish questions at bedtime and the latter often full of tales and myths (some frightening) to entertain her charge. This chapter starts to convey this fantasy world as if it is real. Indeed, the book literally serves to make it real. Embroidery causes some talk of punishment: spanking. Interspersed with theories on 'slaves' and 'persons'. This aspect reminds me (perhaps me alone) of the phenomenon of Marmite. People who love Marmite can't imagine people who hate it, and vice versa. But perhaps more of that conundrum later in this review. "Plucking eight buttercups I placed them between my toes, contemplating the effect. They tickled a little. For a few minutes, the sensation seemed pleasant - then I decided that it wasn't, and removed the flowers. 'I suppose it must, my sweet.' "
More conversations and situations surrounding the young Princess Margaret with her nanny, her mother and with other figures seen precisely yet vaguely (an artful narrative indeed to convey a young girl's observations of the world around her gradually emerging for herself as well as for the reader) ... involving war, politics, philosophy, and the three S's within what I call the the 'Marmite' conundrum of PFJ's fiction: Sapphics, Slaves & Spankings ... and the womanhood (personhood not slavery) of which Margaret feels herself due to become part eventually. "On my way downstairs, it occurred to me that - if Nanny Spencer had placed the boots in the cupboard - she presumably knew that I was about to be assigned to a riding instructor. Had she known, before I did, that we were to part? If so, why hadn't she mentioned it to me? The whole world seemed a grown up conspiracy against me." A conspiracy against her like the impending novel itself? Poignant partings afoot, we are shown a fourth S in this chapter - that of the turning Seasons of this world, their smells and other truly felt senses. Also the continuing ritual, received with equanimity, of 'warm bottoms' as some metered custom of punishment or simple wear and tear like horse-riding. "...titled with a small label in spidery script reading 'A Description of Surrey'. / The long word 'Description' defeated me, but my reading skills were adequate for the name 'Surrey'. Perhaps, I hoped, the part I couldn't read meant 'wickedness' - the s-c-r - suggestive of screaming, scratching and screeching - looked wicked. Leafing through, I encountered a picture that could only depict the Cracked Meadow, of which Nanny Spencer had told me. Unable, in my terror, to look at it for more than a few seconds, I quickly turned the page." And so, as our heroine explores the library, we meet another S: Surrey. If I recall correctly from earlier drafts of these novels: another S: Surrenity, will eventually emerge? There continues to be really beautiful description here, e.g. of theatre going and horse-riding, in addition to that quoted description of 'description'. And Margaret in conversation with a maturely promising Miss Fletcher about things for older ears; yet another S seems to start emerging ('the goddesses hate lies'), i.e. Spirituality. Perhaps we are complete now with our S's: Slaves, Spanking, Seasons, Sapphics (Surrenity?) and Spirituality (pregnant with many prospective, possibly bitter-sweet, facets of life in this 'fantasy' world)? -- A Conundrum. Margaret Might (my expression). Might what? Mighty, how? She learns the facts and fanglements of life. A Symphony of Childhood. But one where I remain tussling with its imputations of behaviour that do not necessarily resonate with my own. An embroidery or tapestry which I, as reader, haven't yet used the potential skills of this world's needlepoint to create?
" 'I tried to sew a field mouse balanced on an ear of wheat. Grandfather thought the gods might think we were asking for a plague of mice.' "
Corporal punishments from sergeant-major type ladies of instruction seem ever on the hair-trigger for our demure Princess. However not so demure, as she shows signs of ingenious methods of revenge - via embroidery - and revenge that actually goes beyond the realms of apparent reason ... alongside her less than secret delight! Much pungent description as well as copious easeful dialogue and in the background her horse - Star-Socks. And suspicions of Surrenity infiltrating the purlieus of Essex where Margaret is living currently and where such acts are more than just officially frowned upon?